Belgravia 2 ... looking to emulate the success of Belgravia 1. 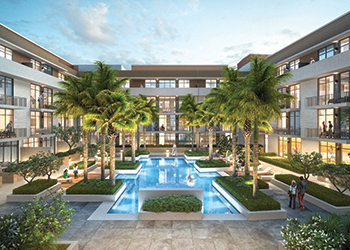 UAE-based Ellington Properties, a boutique property development company, has launched Belgravia 2 in Jumeirah Village Circle (JVC), an upcoming residential district in Dubai. This follows the success of Belgravia 1, which recorded a sell-out response from investors of over 40 different nationalities, making the community one of the most diverse in JVC, says the Dubai-based company. Belgravia 2 is an elegant community with 188 perfectly designed units that comprise townhouses, studios, and one-, two- and three-bedroom apartments. The public spaces feature elegant furnishings with 2D and 3D art pieces by local designers and artists. Outdoor amenities include a large swimming pool and elegant landscaping with palm trees around the property, it added. Five other Ellington projects have already broken ground and will add over 600 residential units across Dubai, and several other future projects are in the development phase, marking a significant expansion of the company’s project pipeline, says a top official. Schon Properties, a major UAE property developer, has announced the transfer of 2.33-million-sq-ft developments at Dubai Lagoon to Xanadu Real Estate Development, a landmark move in the overall development of the Dh7-billion ($1.9 billion) master-planned mixed-use project. The move paves the way for the development of Dubai Lagoon and other projects on the same site by multiple developers, says Schon Properties. As per the deal, Xanadu Real Estate Development – a Dubai-based private developer – will develop the residential component of Dubai Lagoon. The transaction marks a major milestone in Dubai’s real estate market that will help boost investor confidence, it stated. This deal is set to create synergies amongst developers that will help the projects to be fast-tracked for delivery before the Expo 2020 mega event. On the major property acquisition, Schon Properties says the agreement involves the development of a 2.33-million-sq-ft area in three phases of Dubai Lagoon, including Rowan, Lilly, and Winterberry developments. Noorul Asif, the chief operating officer of Schon Properties, points out that due to its close proximity to the Dubai Expo 2020 site and the new metro line – Expo Link – passing by the site, the development’s market price has started to gain. Asif says the deal will enable Schon Properties to focus on developing iSuites – a massive home-grown hospitality portfolio that will see the development of 2,550 hotel apartments. “Additionally, Schon has committed its focus towards hospitality, and this further proves their commitment toward the sector,” he adds. RAK Properties, a leading property developer based in Ras Al Khaimah, UAE, has awarded a Dh11.5-million ($3.13 million) contract to Al Nuaimi Group for carrying out enabling works at the InterContinental Ras Al Khaimah Mina Al Arab Resort. Operated under the InterContinental Hotels Group’s (IHG) luxury brand, the 350-key resort will feature a variety of luxury rooms and suites, a health club and spa, two pools, a well-equipped gym, and a number of specialty restaurants. “As Ras Al Khaimah’s new entertainment and lifestyle hub, Mina Al Arab will feature an array of five-star facilities and entertainment outlets providing visitors and residents with an unparalleled experience of the best Ras Al Khaimah has to offer,” he says. Once open in 2019, the InterContinental Ras Al Khaimah Mina Al Arab Resort and neighbouring Anantara Mina Al Arab Ras Al Khaimah Resort (scheduled for completion in late 2018) will support Ras Al Khaimah’s goal of welcoming 2.9 million visitors by 2025, he adds. Mina Al Arab – a mega development in Ras Al Khaimah with an estimated investment of Dh5 billion ($1.36 billion) over the next five years – is situated some 45 minutes from Dubai International Airport. 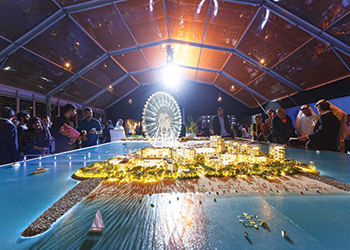 UAE developer Meraas held an exclusive preview of its stunning new residences at Bluewaters, a vibrant cosmopolitan island in Dubai that will also be home to Ain Dubai, the world’s largest observation wheel. More than 300 special guests attended the event held on the newly-built bridge that connects the island to Sheikh Zayed Road. Visitors had the opportunity to see for themselves the status of the 17 townhouses and 10 apartment buildings, which include four penthouses and 698 apartments being built at Bluewaters. Bluewaters, situated just off the coast of Jumeirah Beach Residence opposite The Beach, is a modern, family-oriented island destination with a pioneering spirit that blends waterfront living with the exhilaration of urban city life. Saudi Arabian investors have emerged as second biggest players in Dubai’s real estate sector among the Gulf states with 3,294 transactions worth Dh8 billion ($2.17 billion) last year, according to a report issued by Dubai Land Department (DLD). The statistics demonstrate an annual growth in the real estate investment in Dubai by GCC investors, particularly from Saudi Arabia, it stated. Saudi investors occupy the second position among the non-local real estate investors in Dubai while Indian investors with Dh12 billion ($3.2 billion) worth of property transactions topped the list. Indians led the way both in terms of volume and value last year, said the DLD report. “The Saudi investments in Dubai’s real estate market are governed by quantitative and qualitative investments,” says Walid Farghal, the director general Strategic Marketing & Exhibitions, organiser of International Property Show (IPS) being held in Dubai this month (April 2 to 4). The prime reason for this is the positive investment climate offered by Dubai, along with the economic stability in the city, which promises lucrative returns on the real estate investments, he remarks. Secondly, the policies incorporated by the Dubai government are clear and transparent which are encouraging Saudi investment in Dubai’s real estate, says Farghal. “Furthermore Dubai is considered to be a haven for security and stability which attracts investors from within and outside the region alike,” he adds. A recent report released by DLD stated that the real estate market showcased an influential start in 2017 with total transactions in the first 45 days amounting to Dh42 billion ($11.43 billion), as compared to the total investments in 2016 which was Dh91 billion ($24.77 billion) for the whole year. UAE’s newest developer Arada has launched Nasma Residences, its inaugural project in Sharjah, focused on aspirational yet accessible living in an urban setting. Arada is a partnership enterprise jointly founded by KBW Investments chairman Prince Khaled bin Alwaleed bin Talal and Basma Group chairman Sheikh Sultan bin Ahmed Al Qasimi. Residents and investors in the project, which is expected to be completed in late 2018, can now own their homes in a master-planned community of more than 800 contemporary residential properties featuring a host of community facilities in the heart of a vibrant cultural and business hub. Nasma Residences will offer a best-in-class living experience across a choice of two- and three-bedroom townhouses, four-bedroom semi-detached homes and five-bedroom signature villas. The development, which will spread over 5 million sq ft, will be anchored by a 13-acre lushly landscaped park with cycling and jogging tracks and large play areas, a multi-purpose community centre with a club house, a nursery and clinic, an international school, a retail mall and a range of casual dining outlets. Featuring homes ranging in size from 1,500 sq ft to 3,500 sq ft, the project is conveniently located at the intersection of Emirates Road Highway 611 and Maliha Road, adjacent to Tilal City, Tilal Mall and the Sharjah Convention Centre.